America's legions of pop fans have always had a soft spot for Swedish imports. In the '70s it was ABBA, in the '80s it was Roxette, in the '90s it was Ace Of Base, and now in the year 2000 it is 26-year old Staffan Olsson, better known to friends and fans as Bosson (pronounced b_-sahn). With two solidly received singles under his belt now, "We Live" and "Where Are You," and a springtime U.S. tour with Britney Spears and LFO behind him, Bosson has cleared the first rung of success in this country. A featured host on the "Access Hollywood" Grammy Awards coverage in February, Bosson went on to perform "We Live" on "The Jenny Jones Show" at the end of March. In fact, it all started in Los Angeles, when powerhouse KIIS-FM Music Director Michael Steele took the lead in spinning "We Live." "Uptempo and as bright as a searchlight," Billboard raved of the single, calling it "one of the most promising new cuts we've heard. ?Sprouting the kind of sound that top 40 drops to its knees for," the trade magazine continued, "no doubt, this guy is on and ready to play ball." The track took off, working its way into the hearts and minds (and phone-in request lines) of radio listeners in L.A., soon spreading to the rest of the country. "We live and we die," expresses the songs' chorus, "and we learn to find the things we live and die for." With its percolating mix of pop melody, choral harmony, techno beats and solid R&B groove, "We Live" was a microcosm of the artist's personality. "It's about taking care of the things that are valuable to you in life, about taking chances," he said. "You need to have dreams and try to fulfill them ?life is too short to stand there and ask yourself what you did with the time you had." Within weeks, the single was finding a widespread fan base from Detroit and Seattle to Philadelphia, Washington DC, Miami-West Palm and beyond. Those fans have eagerly embraced the second single, "Where Are You," with its yearning notions of romance and longing. Billboard proclaimed, the "lovely mid-tempo ballad will find instant appeal with top 40, thanks to Bosson's youthful (but not childish) vocals, chugging production and simple hook." Already a touring and recording veteran in his native Sweden, Bosson's roots are in the same Stockholm-based studio scene that spawned producer Max Martin (of 'N Sync, Britney Spears, and Backstreet Boys renown). Bosson developed his abilities as a composer, lyricist, programmer and vocalist while recording at his home apartment studio in Gothenburg, the largest city in the southwest of Sweden. When the time came to commence serious work on his forthcoming U.S. and Capitol Records debut album, One In a ", Bosson settled in Los Angeles. "We Live" and "Where Are You" are the first tracks to make it to the airwaves from the new album. Bosson is working closely on the music with several collaborators, including Steve Kipner (who co-wrote Grammy-winner Christina Aguilera's "Genie In a Bottle"); songwriter and producer Jack Kugell; and the team of Dane Deviller and Sean Hosein, who have worked with 98? ?d LFO. 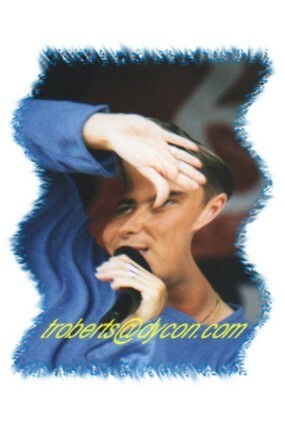 "I've discovered how much I really love songwriting," Bosson told Gavin. "I thought I only could write on inspiration before, but now it's just coming." Where does this artistic passion come from? If song production is one-half of Bosson's universe, then live performance is the other half. "I love to perform onstage," he says, "to get to an audience, to entertain them, joke with them ?it doesn't matter what I have to do to make them happy, make them feel good. The kick I get back when they sing my song, that response is worth everything." He credits his family for the enormous support they gave him while he was growing up. He spent his childhood in the town of S?? (in the very same ?ood as Ulf Ekberg of Ace Of Base), some 20 km to the south of Gothenburg by the Kattegat Sea. Bosson-lore has it that he got the music bug at age six, performing songs during the Lucia festival before Christmas for a small, enthusiastic audience. Early fascination with radio-friendly, melody-driven domestic Swedish pop turned into an all-out obsession with modern R&B as a teenager in the early ?0s: Boyz II Men, Jodeci, and Babyface. "For me it's always been about the vocals and the song," Bosson says. From the Euro-dance format (with its heavy reliance on house and techno beats) which characterized his earlier music of the '90s, Bosson has now evolved into the more worldly guitar pop of the phenomenal "We Live" and "Where Are You." "It's been a lot of work and I've been very focused on my career," he told Network 40 magazine during a break in the album sessions for One In a Million. "I have the chance to have a lot of people hear my music, but I am trying to take it one step at a time and not look too far ahead... If you look too far ahead and create too many expectations, you have a longer distance to fall. If you let your head get too high, it's a long way down. We'll see what happens tomorrow." Sweden's Bosson is a singing sensation. His import release "We Live" created strong buzz for his 2000 U.S. debut album "One In A Million." 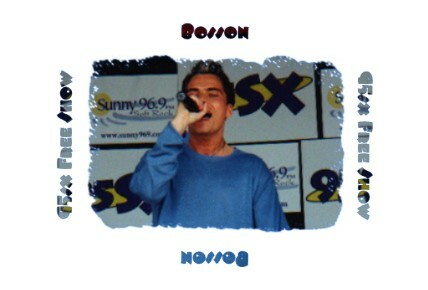 Bosson has toured with Britney Spears and LFO, and in March 2000 performed on The Jenny Jones Show. First concert you ever saw? Performance that stands out for you? Moment in studio that stands out for you? When I recorded "It's Over Now" in my parent's house in Sweden. It was a song about my grandmother who passed away in 1994. Current TV show you like? Classic TV show you like? Talk show or host you like? Host on MTV you like? Show on MTV you like? Show on VH1 you like? Sport you like to watch? Sport you like to play? Favorite food to have delivered to your house? A vacation spot you like? Your favorite hotel/casino in Las Vegas? A person you were exited to meet? A person you would like to meet? Artist you would most like to spend a night with? Favorite person to interview for Like.com? A new clothing company you like? An old school classic clothing company you like? Your favorite brand of sneakers? A web site you like? Which cell phone do you like best? What modern product can you not live without? Favorite music to make out to?